Few spring guns can boast of a list of attributes that include gentle recoil, quiet noise level, smooth action and incredible accuracy. Most spring airguns have one or two of those attributes, but seldom all of them. So, what does the R7 bring to the airgun marketplace and why it doesn't get written about more often? Well, most new airgunners are looking for high velocity and "power" levels. These are not attributes or strong points of the R7. So more attention is paid to the big "howitzers" available on the airgun scene. However, after shooting the high powered air rifles for awhile, many airgunners gravitate toward a gun that can be used strictly for plinking. A gun that is just plain fun to shoot and is not needed for heavy duty pest control or hunting purposes. And that certainly fits the profile of a R7. One can shoot this gun all day long without tiring from the recoil, weight or cocking effort. So by all means, look at the velocity results…….then forget them! That's right…forget them! This is a gun that should be shot simply for pure pleasure. And if you're looking for a real challenge, just go out anywhere on the web and try to find a used R7. Good luck…nobody gives up his or her R7. After all, everyone know a good thing when they see it. The Beeman R7 was my very first spring piston air rifle. My wife bought it for me in late 1982. It had a beautifully figured stock with cut checkering on the pistol grip and came originally with open sights. Within a month we had ordered a Beeman 2-7X Blue Ribbon Scope along with a Beeman Scope Stop. From the very beginning, this rifle has had our deepest appreciation. It is death on gophers and pest birds as well as the ubiquitous tin can or bottle cap. The Beeman R7 is the most accurate, smooth firing air rifle you can buy and, if this review is any testimony you can count on decades of dependable service if you treat it right. Just wipe it down with an oil patch when you are finished shooting and use a nice soft cloth on the stock. With the exception of the smoothing wear on the right side of the trigger guard (after nearly 34 years of use) my R7 looks essentially new. I just put it on the chronograph today. 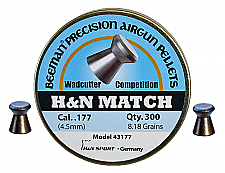 It is shooting slightly faster (by maybe 5 fps) that the "Our Take" review specifies for Beeman Silver Bears and H & N Match pellets, my two favorite pellets for use in this gun. Advantages: The R7 is a pure delight in balance, look, and feel. The adjustable 2-stage trigger allows one to adjust for their shooting style. The cocking effort is about half that of the Beeman R1 and the rifle just naturally "fits' most shooters. This rifle is also the rifle by which to introduce anyone who is "anti-gun" to the fun of shooting. I am always amazed at the look on a new shooter's face when they bust their first aspirin tablet, on edge, at 10 yards. With a properly sighted, scoped R7, hitting a target that small is not really all that difficult for a beginner. Disadvantages: I can think of NO disadvantages associated with the R7 except maybe to suggest a bit more powerful rifle for jackrabbits. Even at that, I am confident that with the right pellet and within 30 yards or less, the R7 could be used effectively on small rabbits and squirrels. I don't even believe the price is a disadvantage. You do get what you pay for and with the R7, you actually get more...much more. Started sighting in my Beeman R7 at 10 meters with a 4X scope and getting 1/4" groups right off the bat with 8.6 gr H&N Field Target Trophy; the R7 quality is superb and my only regret is not having purchased one sooner! Disadvantages: The automatic safety engagement is something to get used to if you are accustomed to ISSF 10 meter equipment without safeties. Absolutely love the R7. I have other springers I like, but every time I pick up my R7 with 3-9 Clearidge mil dot scope it just makes me smile and think "This is REALLY a cool little gun". Nothing to not like about this one. Put your magnum ego aside and add an R7 to your collection. Super accurate, it plinks soda cans handily out to 75 yards (100 if you can dope out the trajectory and there's no breeze). Advantages: Light, super accurate, highest quality, FUN! Disadvantages: None when used within its limits. Got my R7 yesterday and it's awesome. I added a scope to it, with in nine shots was hitting a shot group the size of a quarter. It was really hard to put this gun down. Shot a whole can of pellets today. Knowing you have to put at least a thousand rounds down range to really break this bad boy in I'm totally satisfied. The Germans really nailed it with this gun. Any one interest in shooting air gun, I recommend you save your bucks, wait to buy a R7 believe me you won't be sorry you did. Advantages: Shoots great, not a heavy gun. Has a real easy trigger pull. very well balanced. Nice looking gun, great finish.